NEW YORK – Earlier today, the United Arab Emirates (UAE) called on the international community to strengthen mediation efforts as part of a comprehensive approach to prevent and settle disputes peacefully. 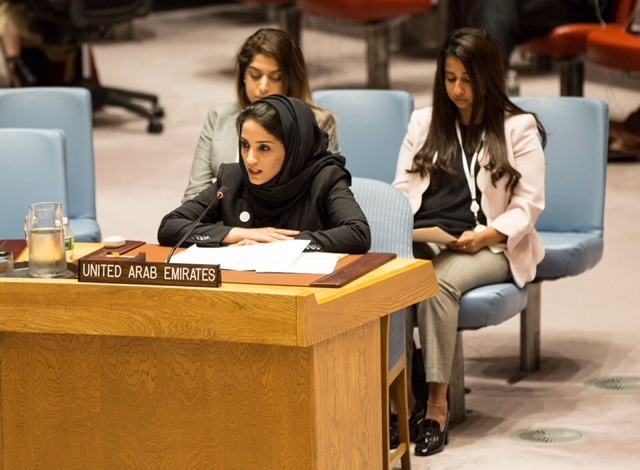 Mrs. Amiera AlHefeiti, Deputy Permanent Representative of the UAE to the UN, underlined the importance of peaceful resolutions at the UN Security Council Open Debate on mediation and peaceful resolution of conflicts. Mrs. AlHefeiti identified the Middle East as a region that could benefit from greater mediation efforts, especially as long-term conflict in multiple countries continues to unsettle the region. To this end, she reiterated the UAE’s commitment to political resolutions and the UN-led processes that underpin them, particularly in Libya, Palestine, and Yemen. “We know that the ‘surge in diplomacy for peace’, as Secretary-General Antonio Guterres has called for, is critical not only for achieving lasting political resolutions to these and otherconflicts, but also preventing conflict from breaking out in the first place,” emphasized Mrs. AlHefeiti. She outlined the UAE’s diplomatic efforts to establish peace throughout the region, highlighting the success of the recent peace agreement between Eritrea and Ethiopia and the far-reaching positive impact it will have on the whole Horn of Africa and neighboring regions. Additionally,Mrs. AlHefeiti underscored the need for inclusiveness in mediation efforts, particularly of women: “Fundamentally, when peace negotiations include women, peace lasts longer. And women must not just be at the table during negotiations – women must also be the mediators themselves.” She also urged the Security Council and UN-led mediation efforts to work closely with regional organizations towards lasting political resolutions. Mrs. AlHefeiti also provided recommendations, including giving full effect to the legal framework for the peaceful settlement of disputes established by Article 33 of the UN Charter. She noted that the Security Council should stand ready to do what is necessary and appropriate to support the efforts of Member States. She praised the vital role the UN has and continues to play in the peaceful settlements of disputes and voiced the UAE’s firm support for the Secretary-General’s High-Level Advisory Board for Mediation. Furthermore,Mrs. AlHefeiti emphasized that while dispute settlement procedures are instituted, parties to the dispute must engage in the procedures in good faith and must not seek to undermine or abuse the procedures for their own political ends.